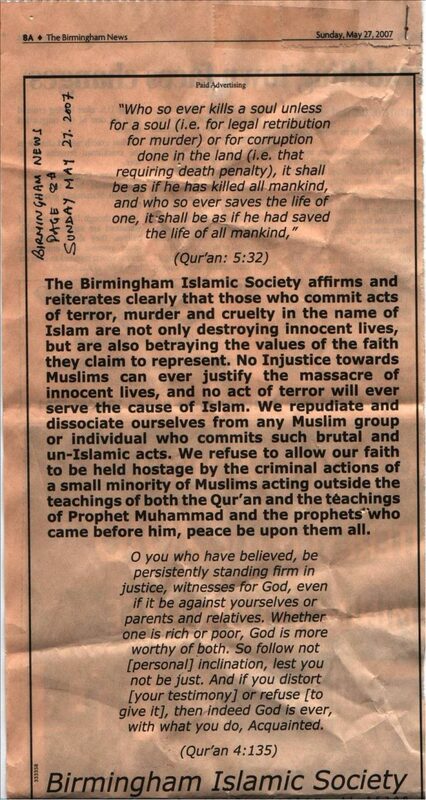 The Birmingham Islamic Society affirms and reiterates clearly that those who commit acts of terror, murder and cruelty in the name of Islam are not only destroying innocent lives, but are also betraying the values of the faith they claim to represent. No injustice towards Muslims can ever justify the massacre of innocent lives, and no act of terror will ever serve the cause of Islam. We repudiate and dissociate ourselves from any Muslim group or individual who commits such brutal and un-Islamic acts. We refuse to allow our faith to be held hostage by the criminal actions of a small minority of Muslims acting outside the teachings of both the Qur’an and the teachings of Prophet Muhammad and the prophets who came before him, peace be upon them all.